Abu Dhabi: His Highness Shaikh Mohammad Bin Rashid Al Maktoum, Vice-President and Prime Minister of the UAE and Ruler of Dubai, on Sunday chaired a meeting of the Supreme Council at the Presidential Palace in Abu Dhabi, on the 47th UAE National Day. His Highness Shaikh Mohammad Bin Zayed Al Nahyan, Abu Dhabi Crown Prince and Deputy Supreme Commander of the UAE Armed Forces, was present. Also present were Their Highnesses the Supreme Council Members and Rulers of the emirates, Dr Shaikh Sultan Bin Mohammad Al Qasimi of Sharjah, Shaikh Humaid Bin Rashid Al Nuaimi of Ajman, Shaikh Hamad Bin Mohammad Al Sharqi of Fujairah, Shaikh Saud Bin Rashid Al Mualla of Umm Al Quwain, and Shaikh Saud Bin Saqr Al Qasimi of Ras Al Khaimah. During the meeting, they renewed the pledge to continue to work on enhancing and consolidating the Union and paving the way for a new phase of the UAE’s history where the Federal Government and local governments will work in full coordination and integration to preserve the unity of the federal entity and maintain its gains. The rulers exchanged greetings on the National Day and extended their deepest congratulations to President His Highness Shaikh Khalifa Bin Zayed Al Nahyan, who leads the country’s drive towards greater progress and a more prosperous future. They expressed their appreciation to Emirati citizens for their efforts and dedication to the nation, saluting UAE Armed Forces’ commanders and officers as well as security services and martyred heroes who dedicated their lives and sacrificed their precious blood for their country’s glory.High spirits, pride and joy lingered in all corners of Sharjah’s Al Qasba canal area as the nation celebrated the 47th National Day. 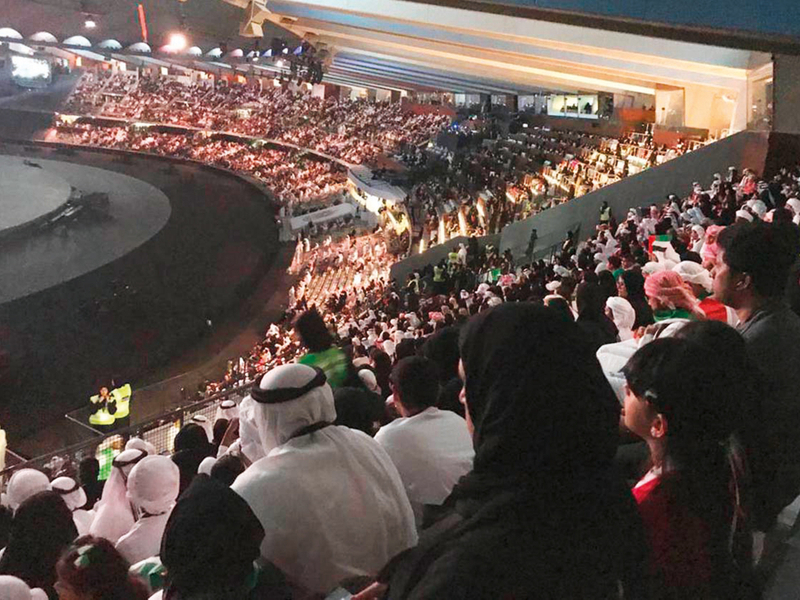 The rulers underlined that the National Day celebrations reflect the national cohesion and strengthen the spirit of the union and its noble values laid by the late Shaikh Zayed Bin Sultan Al Nahyan, the founding father of the nation. 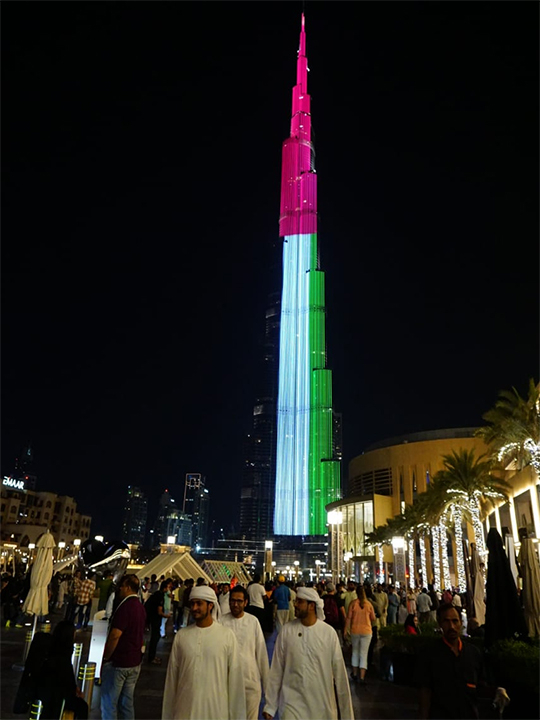 They thanked the leaders and peoples of countries in the world who shared with the UAE its joyful celebrations of its national day, which coincided with the Year of Zayed, making Emiratis and residents joyfully celebrate two occasions. 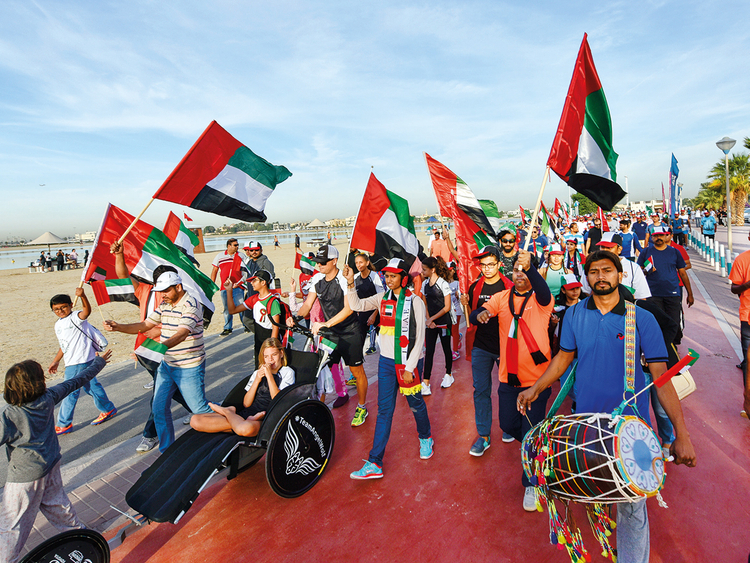 They emphasized that the UAE has become a living example in promoting the culture of tolerance and a role model of humanitarian work emulated by others. The rulers highlighted the importance of their meeting this year, which gains special significance because it coincided with the UAE’s successful launch of its Emirati-built satellite KhalifaSat that marks a new milestone for the space sector — and transforming the UAE into a regional and international hub for space science and technology. The council members reviewed the country’s drive of national action and its future approaches, as well as the latest regional and international developments. 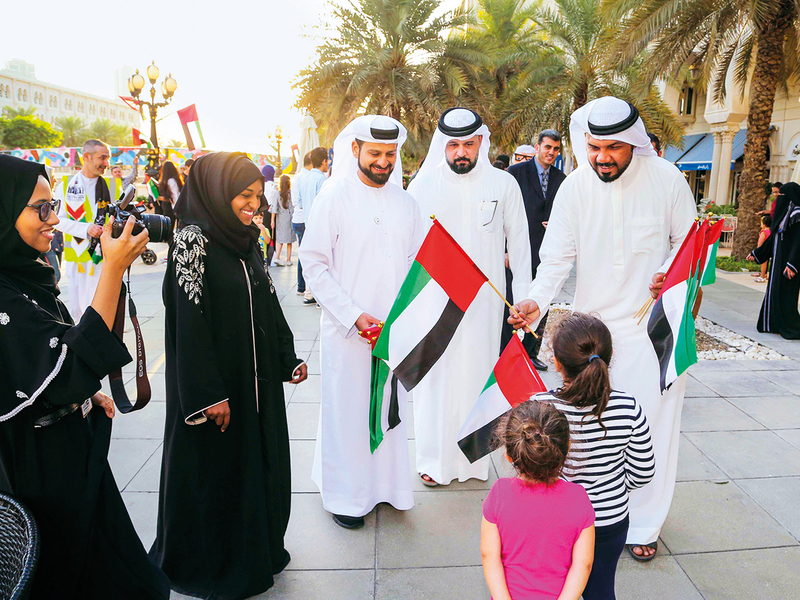 They praised Emirati diplomatic efforts and role in entrenching the country’s reputation on the global map. They thanked Shaikh Abdullah Bin Zayed Al Nahyan, Minister of Foreign Affairs and International Cooperation, and his team, for their outstanding diplomatic efforts that crowned in having the UAE passport being ranked first globally as the most powerful passport. At the end of the meeting, the Rulers lauded the excellent government performance at both federal and local levels, and instructed for the launch of more policies, strategies and future plans that would help strengthen the march of progress and sustainable development in the UAE as well as its competitiveness and competence of Emirati human resources, to ensure the happiness, wellbeing and dignified life of its citizens and expatriate residents.